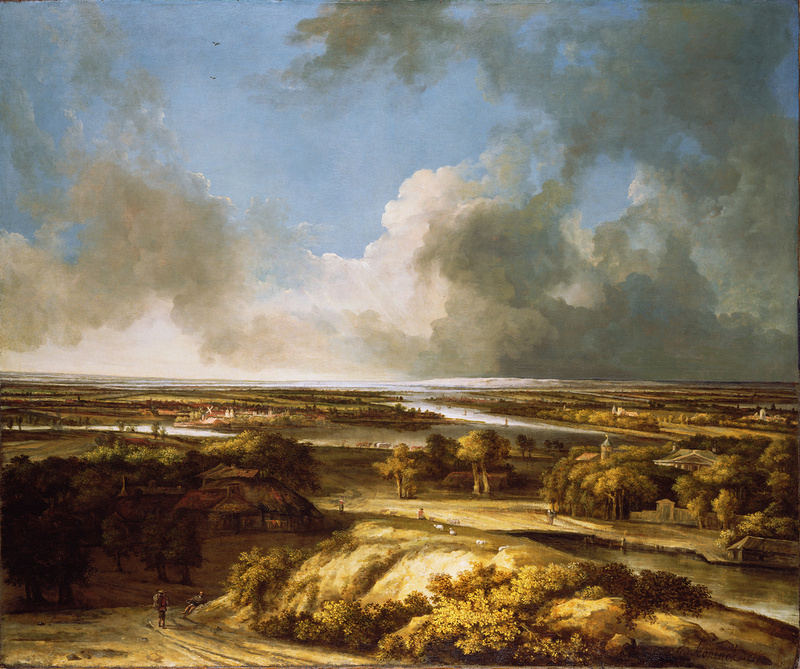 Lower right: "P. koninck 1665"
Seen from a high vantage point, this panoramic view of a Dutch landscape seems to extend into a limitless distance. Sweeping clouds dominate the dramatic sky, emphasizing the low flat expanse of the land below. Patches of sunlight illuminate the water, trees, and buildings of a broad plain traversed by a winding river. Philips Koninck specialized in painting panoramic views of his native countryside. Although the view seems convincing, he composed this imaginary landscape from various raw elements of nature, playing with expressive lighting and perspective upon a natural stage. The view assumes a point of view high above the earth, which did not exist in the flat land of Holland. Charles Henry Mills, first baron Hillingdon, English, 1830 - 1898 (London, England), by inheritance to Charles William Mills, 1898. Charles William Mills, second baron Hillingdon, English, 1855 - 1919 (London, England), by inheritance to Arthur Robert Mills, 1919. Arthur Robert Mills, third baron Hillingdon, English, 1891 - 1952 (London, England), by inheritance to Charles Hedworth Mills, 1952. Edward Speelman, Ltd. (London, England), sold to Emil Georg Bührle, 1955. Emil Georg Bührle, Swiss, 1890 - 1956 (Zürich, Switzerland), by inheritance to his heirs, 1956. Heirs of Emil Georg Bührle, Swiss, 1890 - 1956 (Zürich, Switzerland), sold through Edward Speelman, Ltd. (London, England) to the J. Paul Getty Museum, 1985. Exhibition of Works by the Old Masters, and by Deceased Masters of the British School [...], exh. cat. (London: Royal Academy, 1887), p. 19, no. 72. Gerson, Horst. Philips Koninck: ein Beitrag zur erforschung der holländischen Malerei des XVII. Jahrhunderts: mit vollständigem Oeuvrekatalog (1936; repr., Berlin: Gebr. Mann Verlag, 1980), p. 113, no. 97. Dutch Pictures 1450-1750: Winter Exhibition, 1952-53, exh. cat. 4th ed. [illustrated souvenir] (London: Royal Academy of Arts, 1952), p. 55, ill.
Winter Exhibition, 1952-3. Dutch Pictures, 1450-1750, exh. cat. (London: Royal Academy of Arts, 1952), p. 55, no. 269. Gerson, Horst. "Dutch Landscape." Burlington Magazine 95, no. 599 (February 1953), p. 48. Sammlung Emil G. Bührle, exh. cat. (Zurich: Kunsthaus, 1958), pp. 68, 192, no. 75, pl. 24. Hauptwerke der Sammlung Emil Georg Bührle-Zürich, exh. cat. (Munich: Haus der Kunst, 1958), p. 32, no. 90. MacLaren, Neil. The Dutch School (London: The National Gallery, 1960), p. 211, under no. 836. Plietzsch, Eduard. Holländische und flämische Maler des XVII. Jahrhunderts (Leipzig: E. A. Seemann Verlag, 1960), p. 111. Stamm, Deirdre C., ed. Rembrandt After Three Hundred Years: An Exhibition of Rembrandt and His Followers, exh. cat. (Chicago: The Art Institute of Chicago, 1969), pp. 76, 136, no. 74, ill.
Sutton, Peter C. A Guide to Dutch Art in America (Grand Rapids: Wm. B. Eerdmans, 1986), p. 145, fig. 211. "Autres acquisitions ou dons récents." La Chronique des arts: supplément à la Gazette des beaux-arts, 6th ser., 107, no. 1406 (March 1986), p. 62. "Acquisitions/1985." The J. Paul Getty Museum Journal 14 (1986), pp. 217-18, no. 123, ill.
Fredericksen, Burton B. Masterpieces of Painting in the J. Paul Getty Museum. Rev. ed. (Malibu: J. Paul Getty Museum, 1988), unpaginated, no. 28, ill.
Broos, Ben. Great Dutch Paintings from America, exh. cat. (The Hague: Mauritshuis, 1990), pp. 314-17, no. 38, ill., entry by Ben Broos. Brown, Christopher. Review of Great Dutch Paintings from America. The Hague and San Francisco. Burlington Magazine 133, no. 1057 (April 1991), p. 283. Conisbee, Philip, Mary L. Levkoff, and Richard Rand. The Ahmanson Gifts: European Masterpieces in the Collection of the Los Angeles County Museum of Art (Los Angeles: Los Angeles County Museum of Art, 1991), pp. 158, 160, fig. 41a, under no. 41, entry by Richard Rand. Koch-Hillebrecht, Manfred. Museen in den USA: Gemälde (Munich: Hirmer Verlag, 1992), p. 279. "Part I: Catalogue of Paintings Offered for Sale." In Otto Naumann, Ltd. Inaugural Exhibition of Old Master Paintings, 12 January-1 March 1995, exh. cat. (New York: Otto Naumann, Ltd., 1995), p. 85, under no. 17, entry by Peter C. Sutton. Jaffé, David. Summary Catalogue of European Paintings in the J. Paul Getty Museum (Los Angeles: J. Paul Getty Museum, 1997), p. 68, ill.
Fredericksen, Burton B., et al. Masterpieces of the J. Paul Getty Museum: Paintings (Los Angeles: J. Paul Getty Museum, 1997), pp. 68-69, no. 37, ill., entry by Burton B. Fredericksen. Sister Wendy (Wendy Beckett). Sister Wendy's 1000 Masterpieces (London: Dorling Kindersley, 1999), p. 246, ill. The J. Paul Getty Museum Handbook of the Collections. 6th ed. (Los Angeles: J. Paul Getty Museum, 2001), p. 121, ill.